Bob and I visited the community of Oxtongue Lake, in Ontario one spring to help celebrate my dad’s 90th birthday. 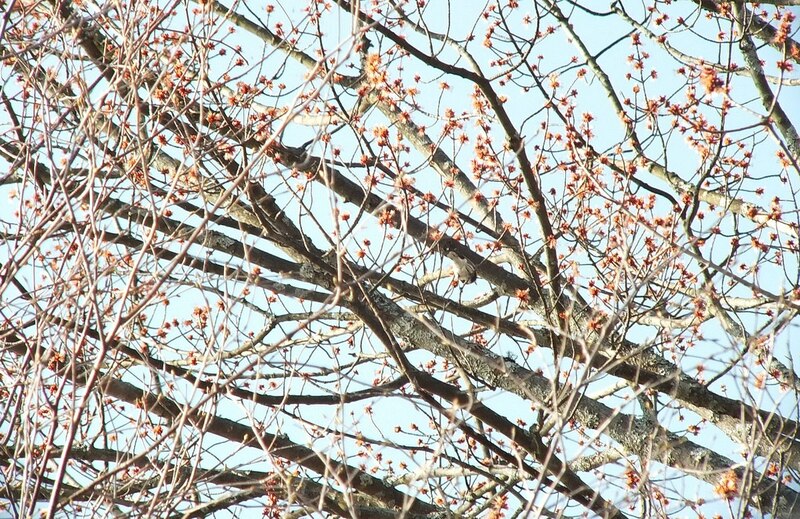 Being early in May, there was lots of activity in the trees with migrating birds returning to their nesting grounds. 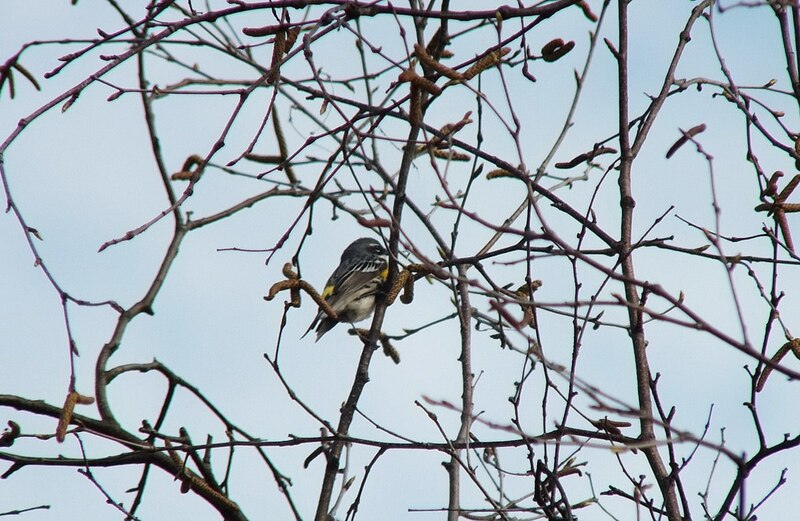 Along Oxtongue Lake Road, we were lucky to see a Yellow-rumped Warbler singing merrily from the branch of a tree at roadside. 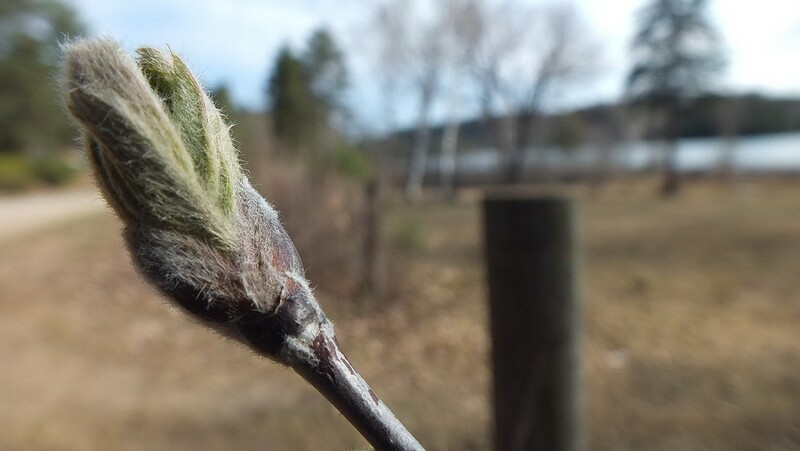 Fresh new growth was evident on all the shrubs, bushes and trees, and early morning sunshine warmed our backs as we walked towards the Oxtongue Lake Bridge. At first, the warbler eluded us where it sat in the middle of a treetop, but by listening carefully, we were finally able to pinpoint its location (right of center) in amongst the newly budded branches. The warbler didn’t stay put in one place for very long, but flitted from treetop to treetop. A fellow group of birdwatchers visiting the area from England was enthralled with this warbler as well as other species of warblers that they had spotted earlier that same morning. A pair of Hooded Mergansers also caught our attention as they swam along the shore of the lake. 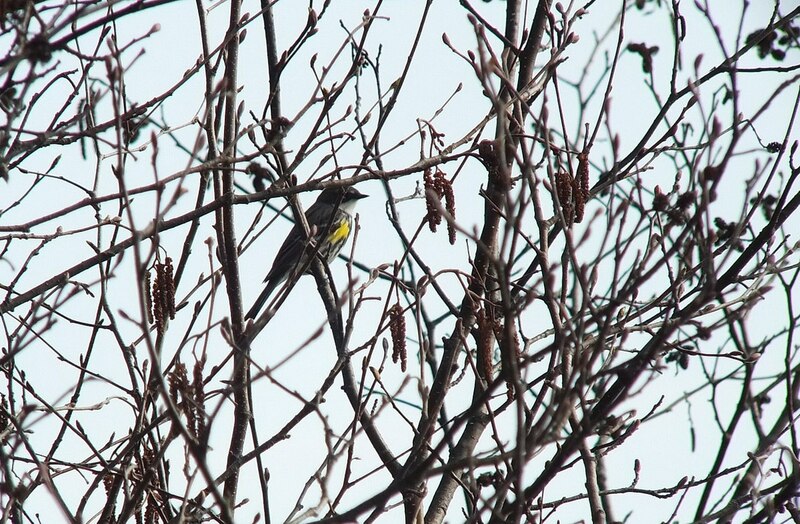 It soon became apparent to Bob and me that we were dealing with more than one Yellow-rumped Warbler. Here, we see a female. 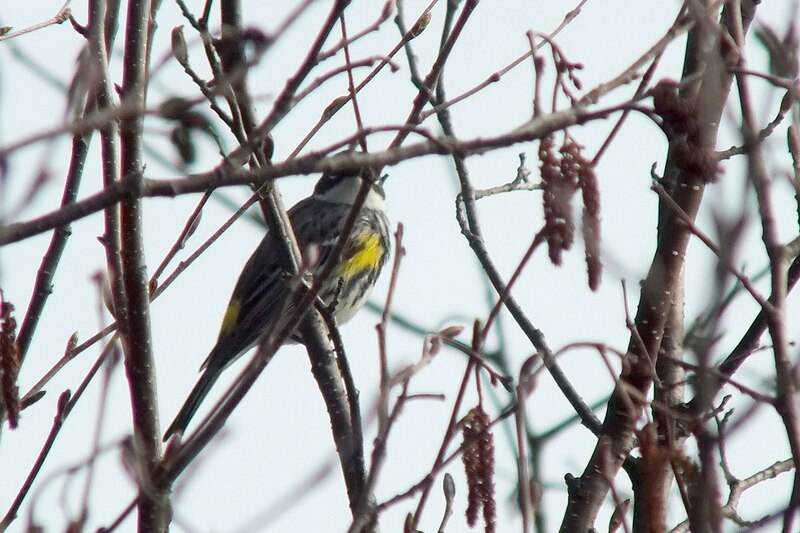 There are several variations of Yellow-rumped Warblers, but each possess a bright yellow rump. 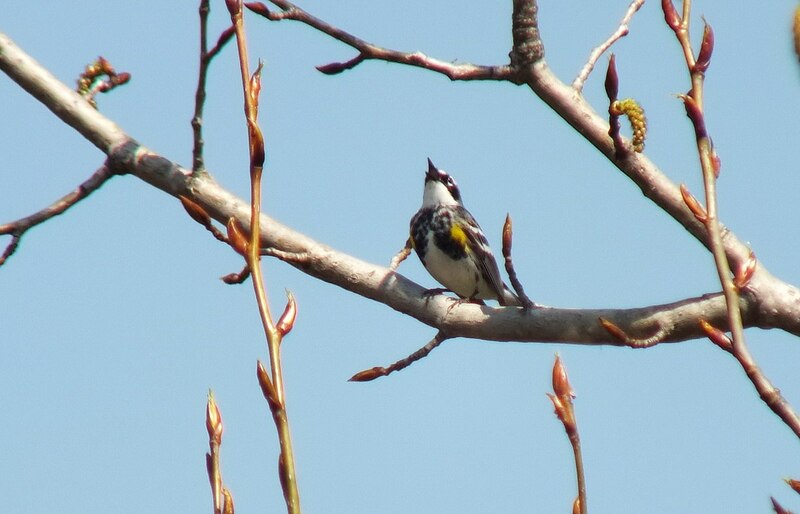 The birds we saw were Eastern Myrtle Warblers. 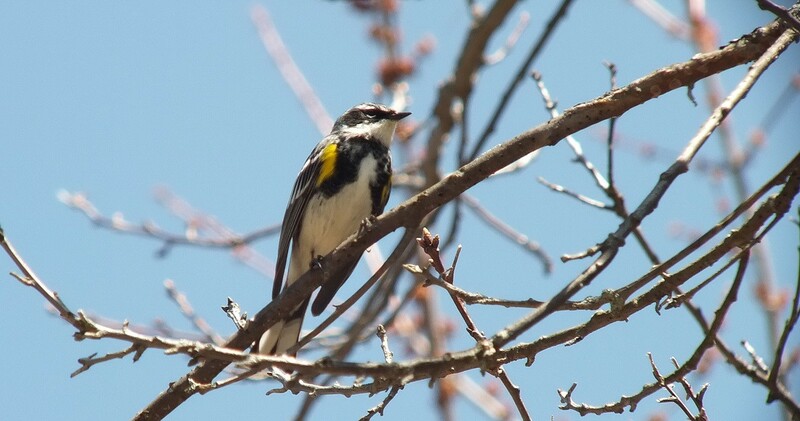 Yellow-rumped Warblers are fairly large, full-bodied warblers with a large head, sturdy bill, and long, narrow tail. They are probably the best known and most frequently encountered wood warblers. In winter, the Myrtle form migrates to the southern United States but will go as far as the Caribbean. Among warblers, it is one of the last to leave North America in the fall, and one of the first to return in the spring. They spend the breeding season in mature coniferous forests or mixed woodlands that include patches of aspen, birch or willow. 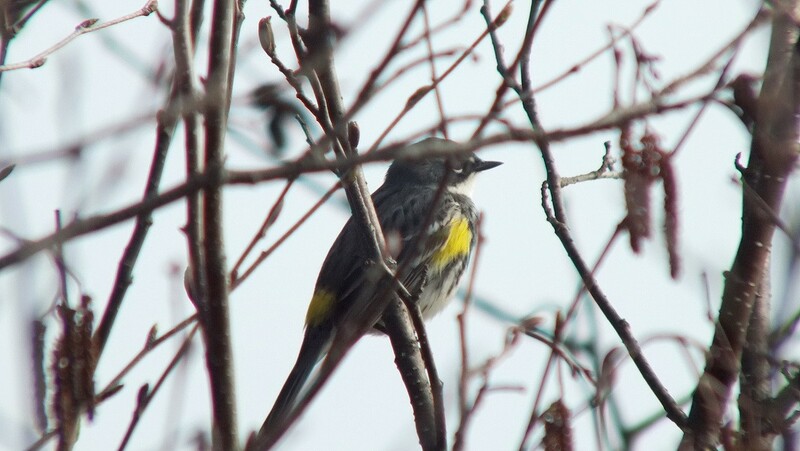 The plumage of Yellow-rumped Warblers is quite subdued all winter long, but the spring moult brings about a transformation that leaves the birds a dazzling mix of bright yellow, charcoal grey and black, and bold white. This female’s plumage is similar in colour to that of a male, but the colour is more dull with brown streaking on the front and back. 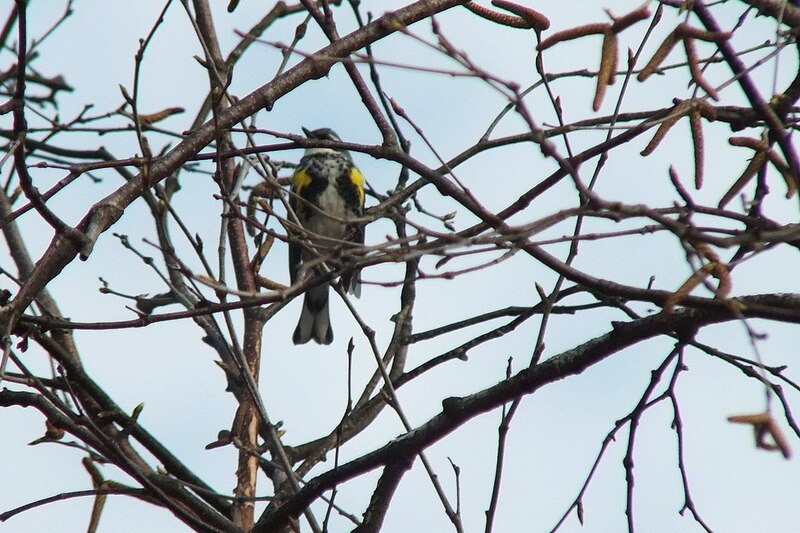 A male warbler has the conspicuous yellow patches on its flanks and rump, and black streaks on the upper breast and sides, that are characteristic of the Myrtle form. We can’t see the yellow patch on its crown. 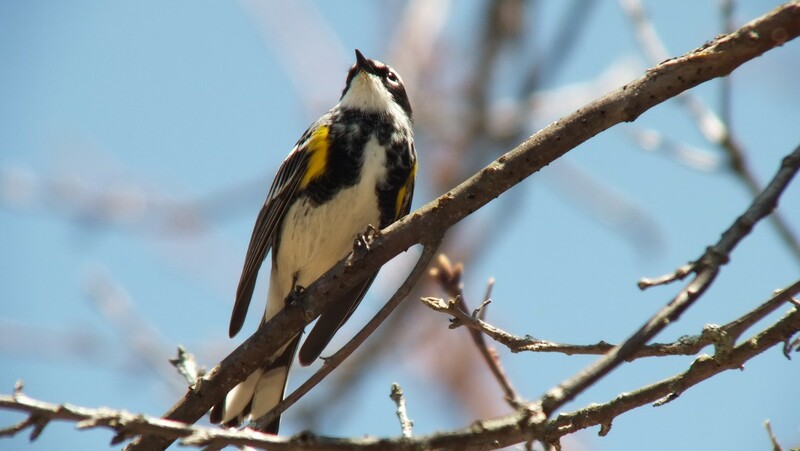 All Myrtle Warblers have the diagnostic white throat and eye stripe with a contrasting darker cheek, black in the male and charcoal in the female. As the warblers darted about from tree limb into nearby thickets and back to the treetops, it was a challenge for Bob and me to keep them in our viewfinders. This warbler was really showing off that morning, probably for its mate that was never far away. It repeatedly sang its cheerful trill of notes. When one warbler perched on a branch right above my head, I had a good chance to study the black pattern on its breast, the shape of the tail, and the white spots on the tail feathers. 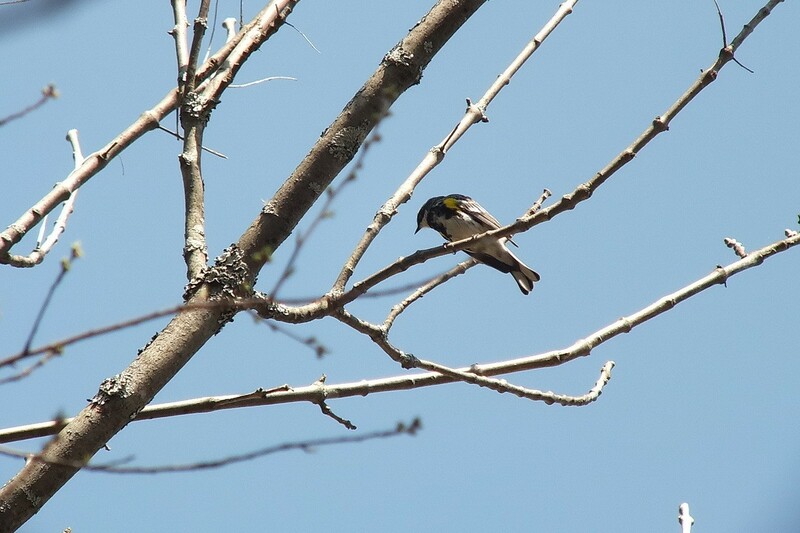 It appeared that the warblers were foraging for food, seeming to scour the twigs and buds for insects. 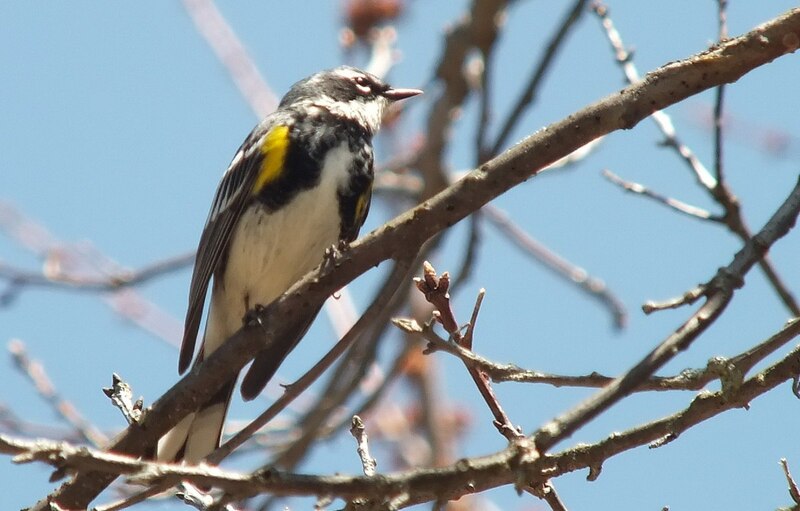 Yellow-rumped Warblers are the most versatile foragers of all warblers. They are insectivorous, but when bugs are scarce, the Myrtle Warbler enjoys eating fruit, especially the wax-myrtle berries from which the bird gets its name. It is the only warbler capable of digesting their waxy material. We should be thankful that the fruits of poison ivy and poison oak also make up a portion of this warbler’s diet. Bob and I thoroughly enjoyed our endeavors that glorious spring morning as we traipsed from one beachfront property to another in our attempts to get pictures and footage of the birds. In looking back at our photos, we can see discreet variations in the colouring of the plumage on each bird, confirming that there were several in that one location. In any event, they really charmed and entertained us. 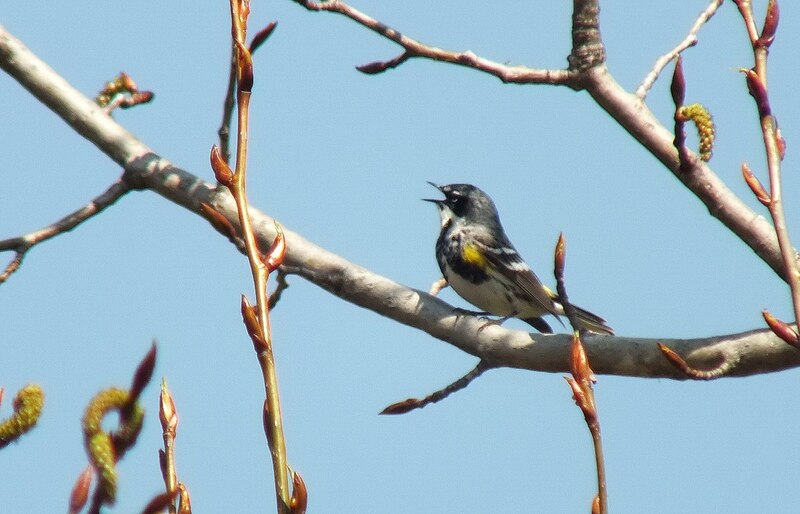 The yellow-rumped warbler is a bird that has definitely benefitted from shade grown coffee plantations. So when it migrates down to Central America, the shade grown coffee plantations are extremely beneficial to them. When purchasing coffee, make sure it says “Shad Grown,” because if it does, then you are helping the yellow-rumped warblers. Once again, you come through with some interesting information. I will have to look at the coffee I buy and see if it is “shade grown”.